I can remember back in the 1980’s when we had an African American bishop named Bishop Terry Steib from the Divine Word Fathers in Mississippi and Louisiana. He very successfully went on to become the Bishop of Memphis. He has since then retired but he is noted for starting some Catholic Schools for minorities. Whenever we had a concluding prayer service, maybe, sponsored by the African American community and we sang a song that I remembered, “Well Done”. Words in the gospel today remind me of that song, “Well done, my good and faithful servant, enter into your Master’s joy”. Bishop Steib just excelled in ordinary worship and service. We were impressed just as we are this week reflecting on the life of Sister Antona Ebo, FSM. Both did their ordinary ministry extraordinarily well. The community will especially celebrate Sister Antona Ebo, FSM with a funeral Mass at 11 a.m., Monday, November 20, at St. Alphonsus Liguori “Rock” Church, 1118 N. Grand Blvd. in north St. Louis. Visitation will take place at 9 a.m. preceding the Mass. 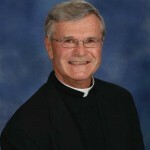 Archbishop Robert J. Carlson will preside at the Mass. Sometimes this parable is given to us to challenge us to use the abilities and talents that we have and not to be lazy about doing them. Maybe that’s good also when we come close to the end of the year when we think about the end time and being alert. As St. Paul says, “We are children of the day, stay sober and alert for ye know neither the day nor the hour.” Also, there is a celebration of women in the first reading about the really “good wife”, basically having the qualities of great love for her husband and her husband having great love for his wife and doing the ordinary jobs extraordinarily well. Such a woman’s value will be of pearls. Maybe a good message for us will be to see the examples of Bishop Steib and Sister Antona as we just do our best and use all our talents, time and abilities. In doing that, it will just happen, and we will claim that the Lord will say to each of us, “Well done, good and faithful servant, enter into your Master’s joy.” Alleluia!